Brainy New York artist Harriet (‘Harry’) Burden breathes fire. Her work – described by one of her collaborators as ‘passionate and sexed-up and scary’ – has been overlooked by the late-twentieth-century art world. Inspired by the seventeenth-century Duchess of Newcastle, Margaret Cavendish, who wrote a utopian novel called The Blazing World and wore men’s clothes when it suited her purpose, Harry plans her revenge: three ambitious solo exhibitions launched under the pseudonyms of three of her male contemporaries. Result: for ‘passionate, sexed-up and scary’ read ‘muscular, rigorous, cerebral’. If only it could be that simple. Harry is a complicated woman: artist, intellectual (and how), wife and mother, she is hot-headed and full of rage and envy. Her experiment ends in tears. 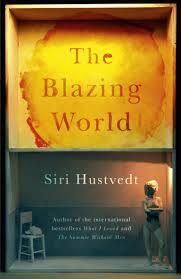 Siri Hustvedt’s novel is presented as a compilation of testimonies: extracts from Harry’s copious Notebooks; reviews and articles about her work; interviews with friends, family, shrinks and collaborators. We read of Harry’s interest in neuroscience and theories of perception; of her lionized art-dealer husband, the voyeuristic Felix Lord, who put her down; of her turbulent romances, her fear of her father, her hurt. She had some good friends, but the last of her male collaborators, Rune, was not one of them. Maskings, the group title of her exhibitions, was a clever idea. Who has not dreamed of greater freedom via an alias of some kind? But Harry wants to catch the art world out, to show it how predictable are its responses. The first of her male ‘fronts’ is a young Adonis who can hardly string two words together about the highly verbal work he is supposed to have produced – a ‘complex joke’ entitled The History of Western Art which becomes a smash hit. The second (much the most sympathetic of the three) is a gay black performance artist, with a challenging walk-through installation called The Suffocation Rooms (think Louise Bourgeois). The third, unpleasant Rune, presents the highly praised maze installation, Beneath, and then refuses to disown it. At no point does one feel that Harry got what she wanted: amazed acclamation from the art crowd. And that’s the problem here. It is a clever novel, but the lasting impression is of an awkward, brilliant woman wasting her life as the aggrieved victim of misogyny. Even if it is true that New York favours the male, it would have been more fun if Harry had had the last laugh.